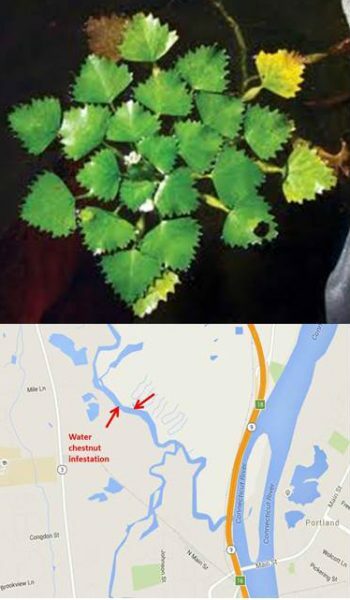 The aquatic plant known as the water chestnut (trapa natans, not the kind you eat in Chinese food) showed its invasive potential this past summer at many points along the Connecticut River and its tributaries. In our own Floating Meadows, the freshwater, tidal marshland formed where the lower Coginchaug and Mattabesset Rivers converge, the presence of these plants was first recorded in 2009. The Jonah Center has been monitoring the area closely since 2013, pulling out a few plants each year. The summer of 2016 was different! Water chestnuts abounded as we have never seen before, forming expansive, dense patches at multiple locations. The Jonah Center and its partners removed approximately 48 canoes full in the course of 8 separate work parties. The most productive effort was on July 22, when we had 14 canoes, 2 motor boats, and 16 kayaks deployed. Each canoe was filled at least twice, yielding a total estimated haul of 30 canoes full on that single afternoon. In 2017, our initial outings were hampered by high water and wind. Still, over the course of the summer we removed approximately 36 canoes full of water chestnut plants. We were successful in clearing the main channel of virtually all plants, though some patches remained in remote areas. We are proud of all we did and extremely grateful to the 80 or so individuals who joined the work parties each summer, and to Middletown’s Public Works Department which disposed of the plant material. This is a fun and gratifying activity. How often can you do something so specific and visible to help the environment? Many new friendships are made along the way. Why are water chestnuts a threat? They spread so fast and form such densely tangled mats that they can overtake a waterway’s entire surface, to the point where boats can’t even get through. With such a thick cover of vegetation blocking out sunlight and air, native plants, fish, fish-eating birds and other aquatic species can suffer greatly. Next year, the Jonah Center will again summon volunteers to start removing the plants early, in June. 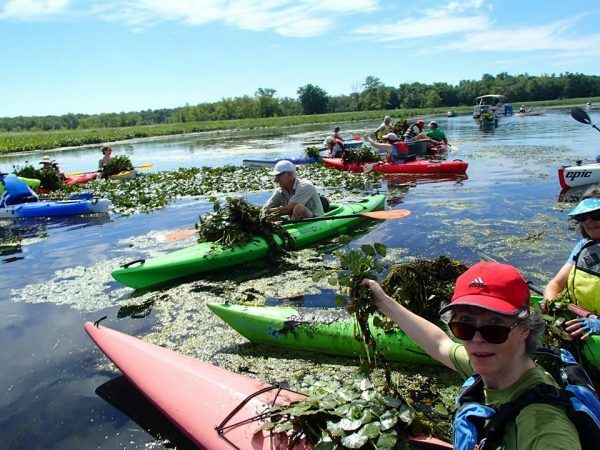 The more canoes we have out there, the more successful we will be in controlling future water chestnut infestations and saving our beautiful waterway. If you want to help, please subscribe to the Jonah Center Email Newsletter at http://thejonahcenter.org/ (look for the sign-up form on the upper left side of the page) so you will know when the first 2018 work party is scheduled. You may also donate in support of these efforts from the same web page. Your contributions are important and much appreciated.